Another Thursday, another throwback anime review. This time, it’s an anime that goes back all the way to 2011 and if you haven’t been keeping track, that’s about 6 years ago. I’m sure most of us have heard of this anime. Some of us might have loved it, hated it, haven’t watched it or just did like myself. It had been recommended to me quite a few times but it didn’t seem all that interesting to me at the time so it lay neglected in my to-watch list for a really long while. Now that I have finished Gosick, I dare say I couldn’t have done a greater wrong. Gosick is based around a Japanese student named Kazuya Kujou who transfers into Saint Marguerite Academy in Sauville. He is nicknamed “Dark Reaper” because of his jet black hair and eyes and also because his fellow schoolmates are very fond of ghost stories. No, the citizens of Sauville are just generally very fond of ghost stories. It goes so far to the point they’ve established a ministry for the occult. Kazuya doesn’t seem to have friends because of his reputation as the “Dark Reaper” which was derived from the ghost story titled “Springtime Reaper” that is familiar around Sauville. One day, he was browsing the school library when he spotted something on the top floor of the library. He ventured up the stairs and eventually reached the top. It was then when he met a blonde-haired, doll-like girl named Victorique who was widely known around the school as the Golden Fairy of the Library. Together they solve mysteries regarding various occurrences by Kazuya gathering information, or fragments as Victorique would call it, and Victorique piecing them together with her extraordinary intelligence as a Gray Wolf. I find the plot to be very unpredictable most of the time and I think that’s the charm of the anime. The genre being mystery, it wouldn’t be very fun to watch if you could predict exactly what was coming next, would it? 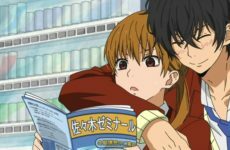 Whether it be solving a case or just casual things like chit chat, I wouldn’t be able to correctly guess what would come next with what I gathered by watching the anime. As romance does play a big part in this series, you’d be surprised that not much emphasis was put on the barely-existent love triangle. 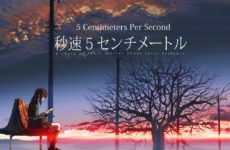 The ending of the anime could be predicted in many different ways and I can’t seem to figure out why it was made in such a confusing fashion. My prediction of it, or how I’d like to believe it went, is that Kazuya survived fighting in the war, Victorique got to greet him when he came back from the war and they had their happy ending. My initial thoughts were Kazuya had died and the rest was a hallucination but I won’t be getting into details here. Verdict: Main focus on mystery as it should be, romance is fairly secondary up until the very end. Good pacing and superb storyline execution. The animation wasn’t amazing. It’s just mediocre, and there really isn’t anything special about it. I felt neutral about it throughout watching the anime because nothing really stood out. The art is also very generic for its time. I don’t really have much to say about this but I think the plot really made up for this particular aspect. Verdict: Both animation and art were as smooth as any other anime, nothing special. 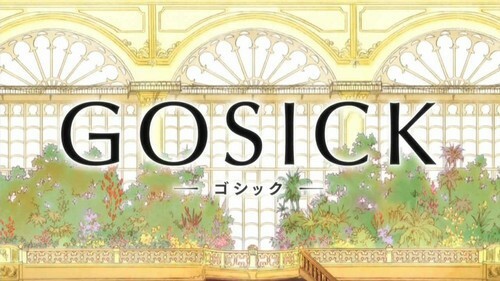 Gosick retained its opening from start to finish and not once did I find it annoying throughout the anime. I love the tune of it. Destine Histoire by Yoshiki Lisa really fit the plot of the anime generally and I had no trouble relating the message of the song to the storyline of the anime. I guess the opening sequence aided in that too, as it depicts the romance in the anime between Kazuya and Victorique. The first ending, Resuscitated Hope by Lisa Komine, has this really catchy tune but it isn’t fast or loud. It’s calming and perfect for an ED. I believe this song refers to the tragic backstory of Victorique and how she copes with it. The second ending, Unity that is also by Lisa Komine, seems to be about the relationship between the two characters. Whenever, wherever, there’s no need to fear. I believe it refers to when Kazuya and Victorique were forcibly separated due to various circumstances but found their way back together. Much like Resuscitated Hope, this ending is catchy yet calm. Verdict: I personally like the music a lot because of the tune but also because of how it seems like it’s all in Victorique’s point of view whereas the main series is mostly in Kazuya’s point of view. They give a vague understanding of Victorique’s feelings and some foreshadowing too. Kazuya was an “oriental” boy who had a good amount of familiarity of his new atmosphere to not experience much of a culture shock. He has two elder brothers and one elder sister back in Japan. Growing up with an Imperial Soldier for a father obviously had its ups and downs. His father seemed to give his brothers more preferential treatment than him. Despite that, he is clearly proud of being the third son of an Imperial Soldier, he even boasts about it during his time in Sauville! He is generally a kind person but he tends to run his mouth when he gets frustrated as shown whenever Victorique gives him a hard time. Kazuya often brings gifts for Victorique to please her whenever he visits. Victorique will initially seem like a princess who’d been born with a silver spoon in her mouth with her sharp tongue and bratty attitude but she actually has a tragic backstory. Her mother had been accused of murder and banished from her own country then raped by a wealthy, deranged politician because she was a Gray Wolf. Victorique was then born on Christmas and has been imprisoned since then. Eventually she was moved to the top floor of the library in St Marguerite Academy where a young Japanese boy would stumble upon her. I’d say she has a very tsundere character towards Kazuya. Verdict: Characters have their flaws and are carefully thought out so the link between each character is definite. The plot is incredible and immensely enjoyable if you’re one to like the mystery genre. The music is also very pleasing to the ear in my opinion. Not to mention the character development is clear and unmistakeable. I really liked this anime and watching it was a great experience. It’s so different and unpredictable, it keeps you on the edge of your seat. I would recommend it to everyone because as someone who isn’t particularly interested in the mystery genre, I found this watch to be exciting and positively erratic. If you haven’t watched it, I absolutely urge you to! Previous Post Activities Galore at Cosplay Commuter!